The cash dividends of South Korea’s four major financial groups topped 2.5 trillion won ($2.23 billion) in 2018, according to reports Sunday. 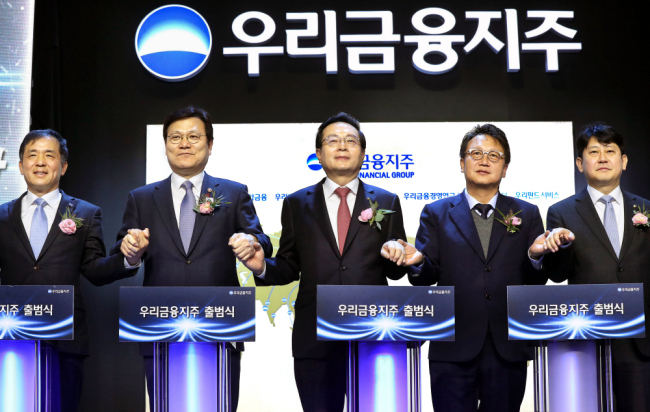 According to the groups -- KB Financial, Shinhan Financial, Woori Financial and Hana Financial -- they handed out a combined 2.52 trillion won to shareholders in dividends last year. The amount was up 8.8 percent from the previous year, when they paid a record 2.3 trillion won. It was also 157.3 percent higher than 979.9 billion won in 2011 when the industry had just rebounded after the 2008 financial crisis. The record-high dividend payout rate was backed by their improved annual net profits. The combined annual net profit of the four groups reached nearly 10.5 trillion won last year, up 18.9 percent from 2011, which boosted the average dividend payout ratio to 24 percent from 11.1 percent during the same period. “Market watchers forecast that the payout ratio would decline due to the financial regulator’s tightened grip on the capital adequacy ratio requirement, but the latest results show that (they) accommodated demands by shareholders amid their improved business performance,” said Kim Soo-hyun, analyst at Shinhan Financial Investment. KB Financial had the highest dividend payout, at 759.7 billion won, or 24.8 percent of its net profit. Shinhan Financial came second with 753 billion won, or 23.9 percent, while Hana Financial and Woori Financial followed with 570.5 billion won and 25.5 percent, 437.6 billion won and 21.5 percent, respectively. Industry watchers noted that the financial groups made their decisions based on their respective management priorities for this year -- boosting their stock value by appealing to shareholders or securing funds for business expansion. Woori Financial, which recently vowed to actively pursue strategic mergers and acquisitions in the nonbanking sector, has lowered its dividend propensity to secure capital. Hana Financial, on the other hand, has increased its dividend payout rate by 3 percent on-year, to attract more investors after a downward trend last year. Some observers, however, expressed concerns over the possible capital outflow, pointing out the relatively high proportion of foreign shareholders in Korea’s financial companies. As of Friday, the foreign shareholder ratio at KB Financial, Shinhan Financial, and Hana Financial stood at 66.45 percent, 67.18 percent and 69.93 percent, respectively.